The list is longer than the time I have left before Thanksgiving. And then my son didn’t feel well today so everything stopped. I could only go to the doctor’s to see if he had strep throat. So we watched “Night at the Museum” and took a nap. And did things at home which really needed to be done. It felt good not to be running around in the craziness and getting caught up in the buying of too much food. It felt good to slow down. Not good to see him sick. But just good to slow down. Without my normal routine, I forgot about blogging. And about picking a winner for that giveaway last week-the winner is zizophora. So please, email me your address and I will be sure to get it in the mail for you. 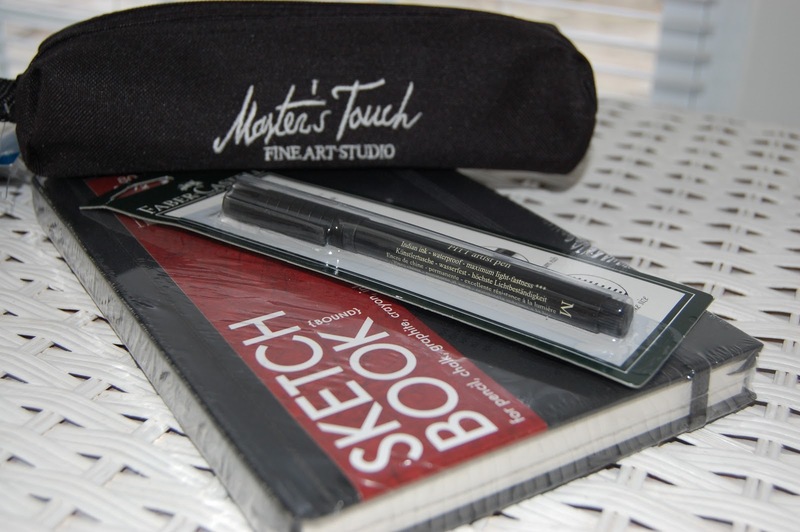 I have been following Melanie Testa and her month of line drawing. Go check out what she is doing. I took a class from her last winter at Joggles and just haven’t added her to my blog list.She is a good teacher and her blog follows her teaching style with her talented info shared so freely. On day 7, she references an artist, Marcus McCallister and his amazing journals. Go check out this youtube vide and see what Melanie is doing. Thanks for your comments and for peeking in. I am going to sit and rip out some awful machine stitching. Be creative, my friends -slow down too. It will all get done and cooked. This entry was posted in blogging, giveaway. on November 23, 2010 by Colleen Kole. I do love the end of the week. And as promised , I have a giveaway for you. It’s a thank you for being faithful friends for the past year while I learned to blog . You have inspired me. So now to pass the inspiration back, or to let you inspire someone else, I have some freebies for you. On each Friday for the next four weeks, I will announce a give away. You need only to comment and let me know about one creative thing that you did in the past week. Maybe it was taking a great photo of your kids. Or you finished the binding on a quilt. Or a painting in a journal. Or drew a sketch of something you intend to make. You certainly know what creative is! On the following Friday, I will announce the winner and the next giveaway. 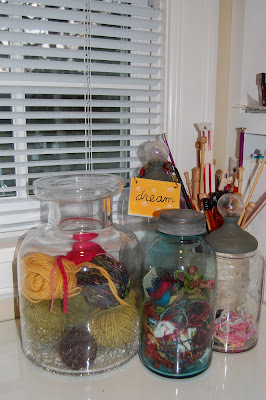 The giveaway is something that inspired or prompted me to do something creative. For this week, it’s a small journal, a Pitt pen and case for your pencils. I started using a journal about a year ago and can’t live without it in my backpack or purse. It goes where I go. Just like my camera, phone and car keys. So leave a comment and let me know one creative thing that you did this past week. I’ll start. I finished a small stitch sampler on linen in which I practiced four of Leah Day‘s machine quilting fillers: etch n sketch, flame, bamboo and checkerboard. Small so I could actually accomplish something! A little imperfect work of the week. Be creative, my friends. Leave a comment on this post and I will enter you in this week’s giveaway. 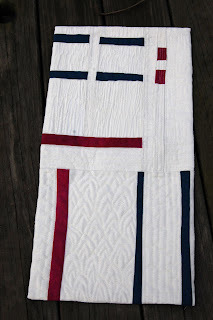 This entry was posted in giveaway., quilts 2010, small works on November 5, 2010 by Colleen Kole. I am in charge(sounds like a lot of responsibility, doesn’t it?) 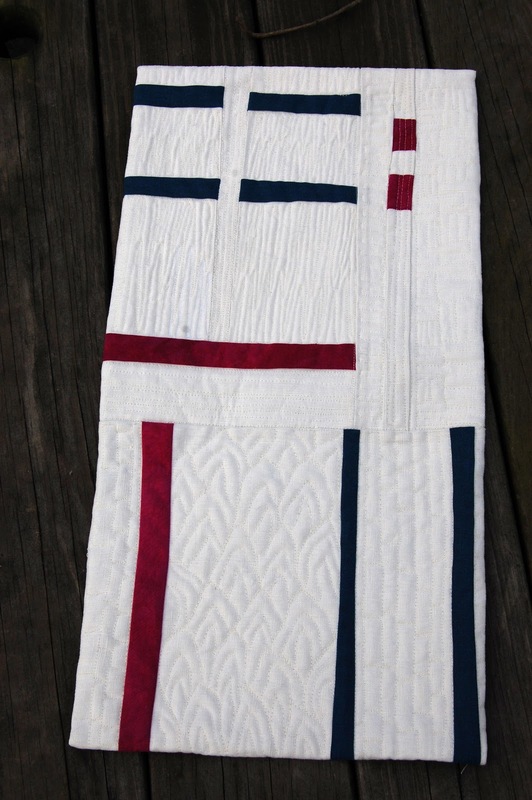 of making an auction quilt for my son’s class at school. Now the auction isn’t until March but I need to start cutting the quilt out to see what I might yet need. So a friend and I will start the project today. I have collected about thirty pairs of old jeans from the kids. 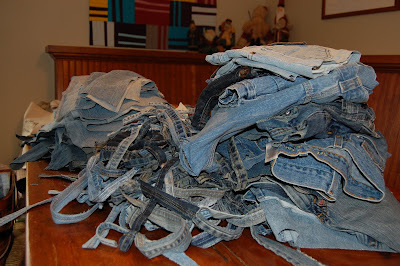 We’ll start cutting them apart today to see how much” fabric” we have. 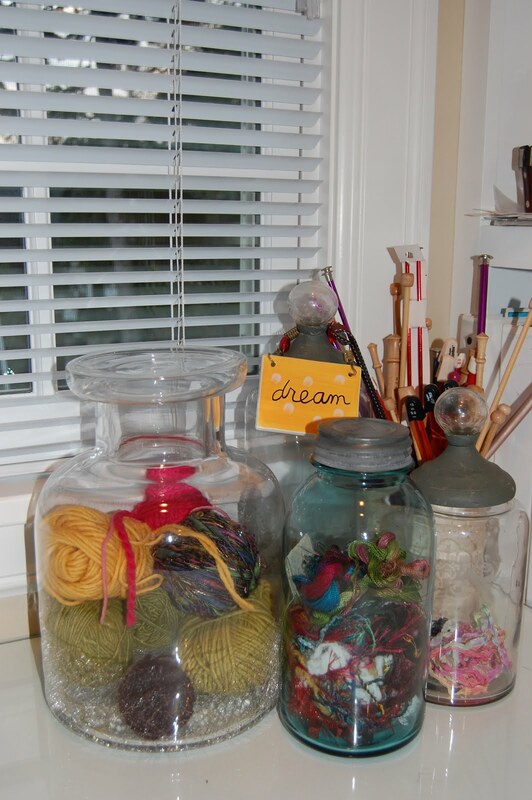 Then I will begin stitching them together in a really random way. Yeah-ok- I have no plan. One piece building off another. It will truly be an improvisational quilt as I have no idea-ok maybe a vague idea of what we will do. I don’t want to give too much away. I do want to include some of the moms after Christmas in this project- they have expressed interest in the process so you never know who you might inspire. Stay tuned as this will be an after the New Year completion I am sure. Now tomorrow I will have something fun for you. A little lottery giveaway but you must think of someone fun to tell about my blog. 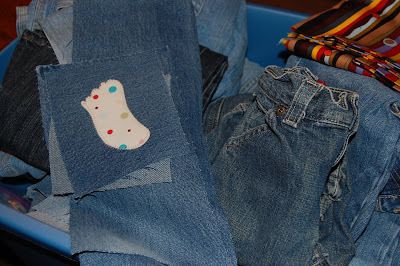 This entry was posted in giveaway., jeans, recycled on December 1, 2009 by Colleen Kole.